The exhibition Gridded Currents explores how nature, in particular the sea, has been ruled and dominated by modernization, in the process of reifying and enforcing modernity’s border-making. 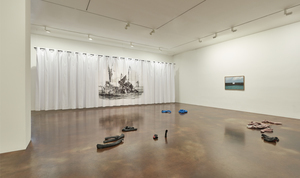 The sea is no longer a neutral landscape as seen in this exhibition—rather, it approaches the ocean as a site of colonial history, a charged marker of national borders, and a target of capitalistic exploitation with its natural resources. 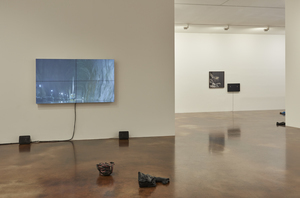 Encompassing object installation, works on paper, wall installation, performance video, and film, the works of Nina Canell, Ayoung Kim, Runo Lagomarsino, and Charles Lim Yi Yong explore various aspects of modernity and other meta-narratives that maintain a distance from everyday reality but remain deeply embedded in the ocean’s depths. 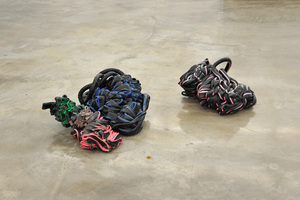 These historical arcs include forgotten or overlooked histories of imperialism and catastrophes as seen through gold and bitumen, struggles of the displaced, issues of nationalism and territorial dispute, and the network of hidden communication cables that crisscross the bottom of the ocean. The sublime qualities of nature have been a favorite subject throughout the long history of painting. By the late 19th and early 20th century, when man began to systematically rule, categorize, control, and exploit nature, as epitomized by the grid or modern matrix, the majority of artists were still focused on the landscape as a means of representing nature. The sea, in particular, served as a popular subject evoking lyricism, as well as being a symbol of kitsch, owing to the fluidity and dynamic movements of its currents. The perennial desire of man to control nature was projected onto these images of dashing waves; the more powerfully an artist depicted a wave, the more profoundly he captured the spiritual sublime of mankind. A century has passed and many artists today are no longer compelled to faithfully represent the dynamic movement of the currents through painterly expression. The sea is no longer seen as an innocuous scenery of waves, sunlight, and high winds, or a symbol for human desire to conquer the unruly nature. The artist Allan Sekula’s (1951-2013) visionary work Fish Story (1995) marks this seminal shift, approaching the ocean as a politically charged location dominated by the logics of global capitalist distribution and commerce. 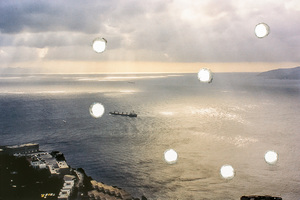 Just like Sekula’s vision and remarkable insight, many contemporary artists are keen to reflect the ocean not only as a place of global capital transaction and connection, but also as a brutal guarding site against the displaced. 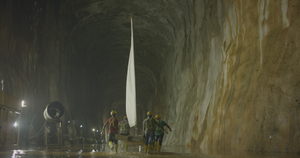 In this context, the sea is viewed as a marker of national boundaries and a catalyst for nationalistic competition; more recently, it is also a contested place for the construction of an invisible heavy industrial infrastructure, as embodied by hidden petrochemical pipelines and communication cables. The four artists in Gridded Currents alert us to the fact that the vast horizon of the ocean is in fact a set of gridded currents, using this metaphor to channel modernity through the marine environment in the contemporary era. In this reading, the sea is recognized as a territory on the map, a site that engenders capital hegemony, and a conduit for neo-liberal data processing. 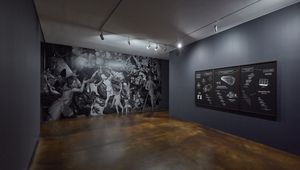 As vitally engaged fragments introducing this phenomenon, the works in the exhibition enable us to engage with this fraught history of modernity, confronting its lingering impacts. 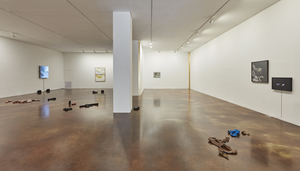 The artists’ varied works focus on these foundations and structures that remain invisible, hidden beneath the currents, providing an aesthetic and oblique passage into their critical investigations.